Hit up Matanga Hill in Hampi for a bird’s eye view of the historic town, its monuments, and the Tungabhadra River. An early morning hike is particularly rewarding thanks to the unforgettable sunrise. 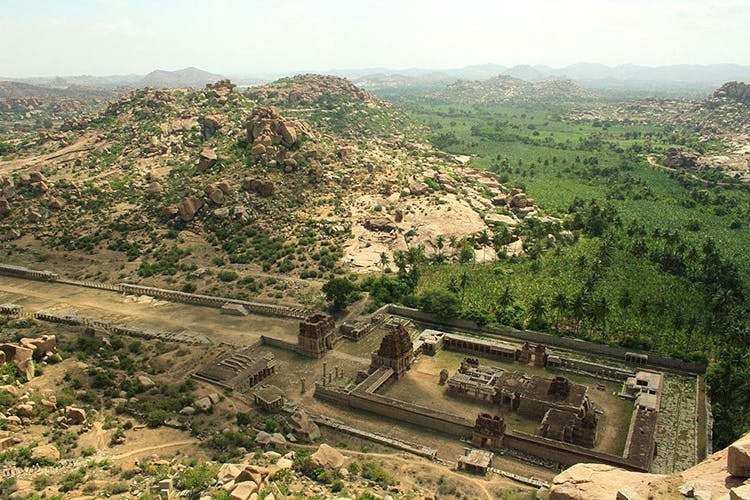 Hampi’s Matanga Hill is a well-known site in the town and is home to the famed Veerabhadra Temple. And while it is open for visits through the day, there’s a special thrill in making your way to the top early in the morning. For one, you escape the hoards of tourists that flock to the city everyday. And, more importantly, you can witness a sunrise that makes Hampi look way prettier than it already is! While there are no tour operators to conduct organised treks to the top, conquering Matanga is no rocket science. The 30-minute trek up is moderately difficult and you’ll need to watch your step at some tricky stretches especially if you are a novice. But that shouldn’t scare you off. Just slip into your most trusted pair of sneakers, grab a torch and get going! You’ll have to hop out of bed at around five in the morning to catch the sunrise (earlier if you aren’t staying in the main town area). There are a few ways you can get to the top. Ask the locals and they’ll usually point you to the easiest one that’s close to the Kadale Kalu Ganesha temple. But we recommend the more interesting route that’s near Hampi Bazaar. This pathway will take you past rocky terrain and also abandoned shrines that you can check out while pausing to catch your breath. When you’ve reached the top, you can explore all corners of the hill to catch glimpses of Hampi. At one corner, you’ll see the Turthu Canal serenely making its way through banana plantations. While on the other end, there’s the Tungabhadra River that flows through the town. In the distance, the Virupaksha Temple looms. And you can also look down to see the Achuta Temple complex as well as abandoned bazaars and Hampi’s rock-studded landscape. Of course, if you can’t make it in the morning, Matanga Hill is also popular for sunsets. However, do get here well in advance to find the best spot to catch the sunset since it tends to get crowded during this time.